Smiley and West – "America is unfair"
I was watching the Colbert Report the other night and the authors of The Rich and the Rest of Us: A Poverty Manifestowere guests. Tavis Smiley is a comical media hound and a Princeton philosophy professor, Cornell West are leaders in the American poverty propaganda campaign. It is a case that supposedly two educated individuals are trying to convince Americans that the wealthier Americans must support the “unfortunate” ones and that government is the best solution. … Oh dear! …The book should have a second subtitle: “How to keep the poor poor and blacks enslaved to government.” To the extent this book is taken seriously by anyone, the result can only be more, entrenched poverty. Smiley and West’s message is simple. America today consists of a few powerful, rapacious rich people and a lot of unfortunate, exploited poor people. The rich are rich because they are lucky. The poor are poor because they are unlucky. And the only way to solve the problem is activist government to manage the American economy and redistribute wealth. … Even if Smiley and West conceded that there might be some element of personal responsibility in how one’s life turns out, their portrait is of an America now so unfair, that personal responsibility is irrelevant. There is no hope for anyone to rise, according to this book, without government boosting them using other people’s money. … That number one lie is: “Poverty is a character flaw.” No way, according to the authors, is there a chance that poverty has anything to do with one’s behavior. Rather, “The 150 million Americans in or near poverty are there as result of unemployment, war, the Great Recession, corporate greed, and income inequality.” Given this insight – that there are 150 million poor Americans whose economic condition is the result of extenuating circumstances – it is no wonder that Smiley and West never once mention what many scholars see as the major causes of poverty – poor education and family breakdown. … The evidence is powerful that getting educated and getting married dramatically reduces the prospects for living in poverty. Yet apparently not sufficiently powerful to interest Smiley and West to note these factors once in their “poverty manifesto.” Despite this book’s message of the inherent hopelessness and unfairness of today’s America, the authors themselves seems to be doing quite well, selling their paperback “poverty manifesto” at $12 a pop. Apparently it’s quite good business to tell Americans that America is unfair. Perhaps this book can be used to reduce competition for jobs by immigrants. According to the State Department, there are currently 4.6 million visa applicants wishing to enter the United States under the family and employment preferences immigration program. They apparently haven’t gotten the word that America is no longer a land of opportunity. Star Parker knows what it takes to become successful – she did it with good old fashion work, ensured she had the education, and sought out an avenue to use her talents as a career. Poor remain poor because they make wrong choices. Poor remain poor because they think that anyone who is successful in life owes them. Poor remain poor because they rely on a government who has had an ongoing war on poverty that has never, and never will be won. It might be kept to a minimum if we raise American youth in the belief that working hard, getting education required, and making good choices in life is what keeps them off the “poor” list. And, to “poor Americans” – you have no clue to what poor really is until you have been where I have been and seen elsewhere in the world. The poor there do not have TV, electricity, automobiles, or even a place to live except in makeshift shanties – with no toilets or running water. That is poverty that can only be found in America in the case of homeless people. That’s rock bottom and unfortunately in the recent economic crisis it is a situation that has escalated. No government bailout for them or those who lost their homes by foreclosure. But its a boost, not a crutch. The effort must come from the individual, not by redistributing wealth to those who don’t deserve it or rather who deserve what they get for what they do in life. The person must change their lifestyle and attitude that got them there in too many cases. 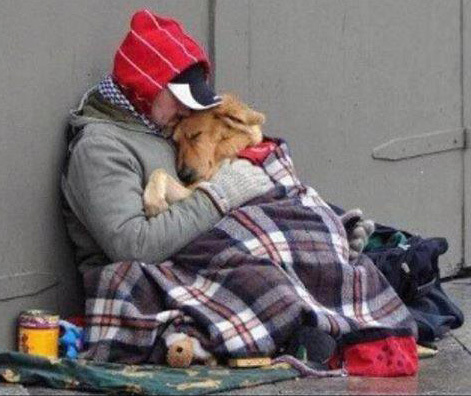 If this photo doesn’t tear at your heart strings, I don’t know what would. This entry was posted in Star Parker, State of Our Union.